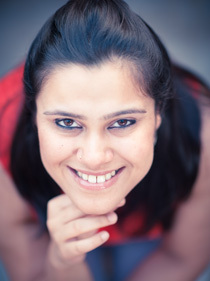 If you haven’t heard of kulkuls before this, and you speak Hindi, then I’m sure there are many kal-kal (yesterday-yesterday/ tomorrow-tomorrow), parson-parson (day-after, day-after) or aaj-aaj (today-today) jokes running through your head. I get it. I’ve thought them all before! 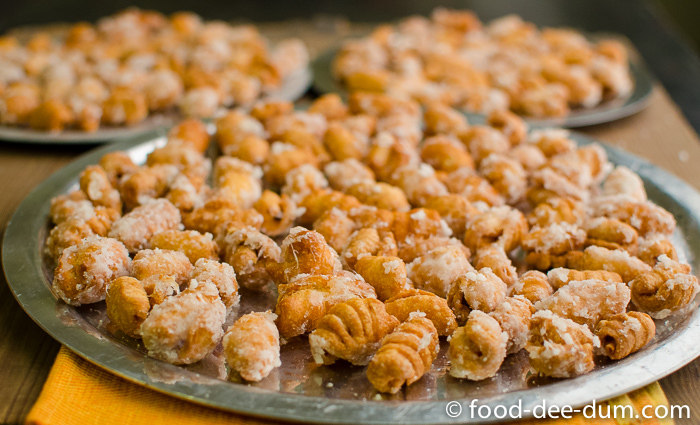 But not before devouring a fistful of these delicious, crunchy kulkuls made by my Dad’s friend, Anne, in Pune. 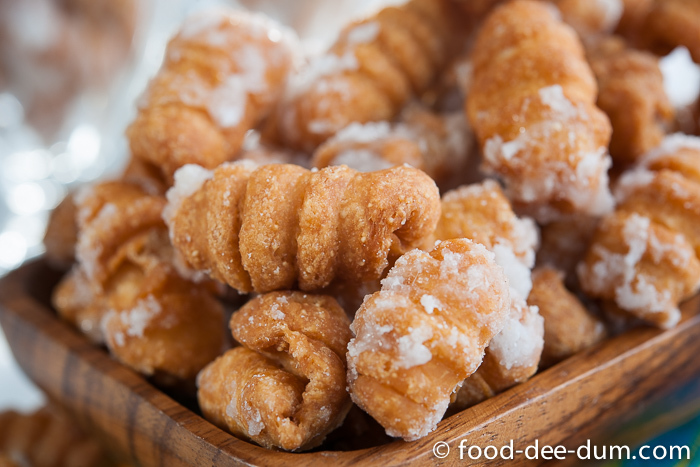 They are the most delightful and addictive bits of confectionary that I have come across – inch long dough curls, deep fried and glazed with thick sugar syrup. 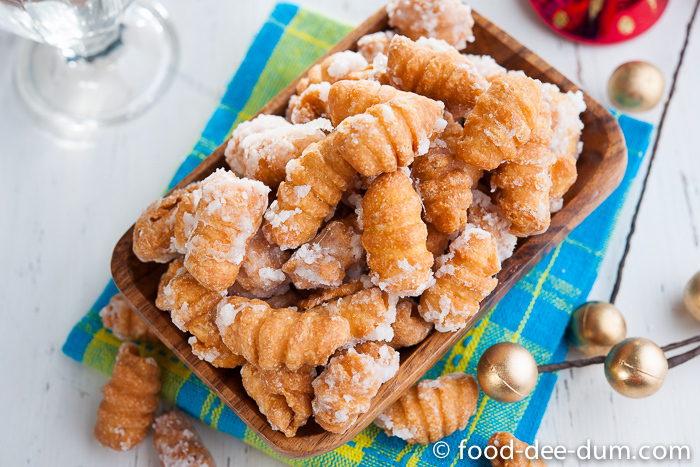 Kulkuls/kidyoare a traditional Kuswar sweet made by the Catholic communities of Maharashtra, Goa and Karnataka as part of Christmas celebrations. It is very typical for families to sit together and share the task of rolling and shaping the dough. More often than not, I’m sure the men find a way to wriggle out of it. But, to my mind, there is something special about members from different generations of the same family getting together to prepare for a festival. Which means that all the kulkuls are shaped and sized differently. But thats part of the charm! I never bothered with the whys and hows of kulkuls before this post. The only thing that I knew for sure is that I’ve loved them my whole life. 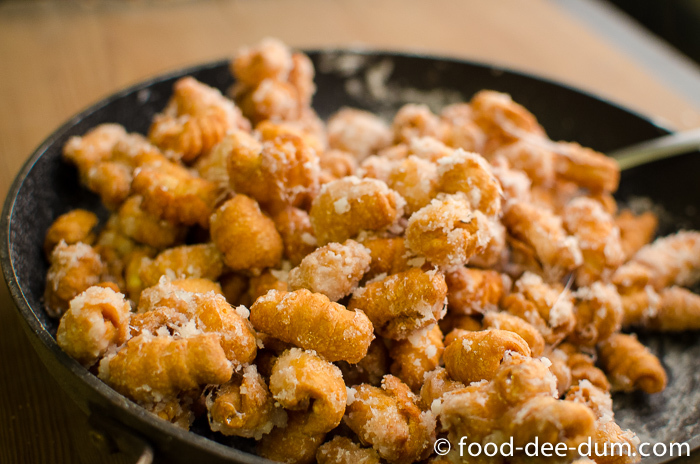 Crunchy, sweet and comforting, they hold the warmth of childhood memories. Memories of winter trips to Pune, attending Midnight Christmas Mass with Aunty Anne & her children Divea+Ayesha+Varun, (and as we got older) attending some Christmas party or the other right after the Mass, sneaking back into the house at an ungodly hour, waking up in time for presents, tea and kulkuls. 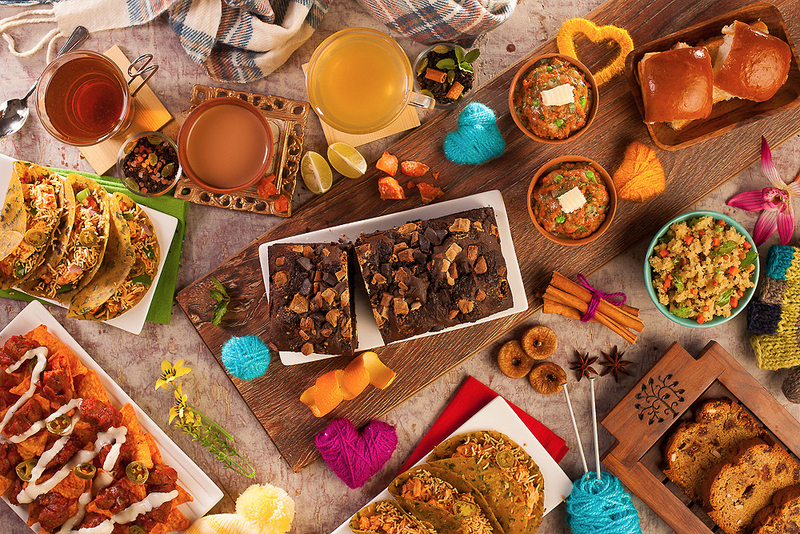 While we sat around the table with our tea on Christmas morning, munching on fistfuls of the delicious confectionary, we dissected the previous night’s events and talked about plans for the new year. At some point during the animated discussion, I always complimented Aunty on the delicious kulkuls and in return she told me stories of the (fun) time that was spent rolling and shaping them with her children and, now, grandchildren. Secretly, I was only too happy with the perfect timing of my arrival in the city — I was able to get my hands on all the goodies without working for them! All I ever had to do was eat and open presents! I asked Aunty Anne for this recipe almost 2 years ago and it’s been sitting in my mailbox ever since, feeling pretty neglected! I decided that this was the year that I would stop procrastinating. So although my rolling and shaping skills could definitely do with some practice, I am super stoked with my first-ever batch of home-made kulkuls. That doesn’t mean that I wouldn’t still kill for a batch from Aunty Anne (hint, hint, if you’re reading this Aunty!). First, I mixed all the dry ingredients in a mixing bowl. Then I melted the butter and stirred it into the dry mixture. Cracking the eggs into the mixture, I gave it another good stir with a metal spoon until it formed a crumbly, shaggy mass. Adding a few tsp of cold milk, I brought the dough together without working it too much. It should not be too moist or soft. Rather, a little “tight” as for pooris and samosas. Patting it into a ball, I put it in an airtight container and let it rest in the refrigerator until I was ready to fry them. 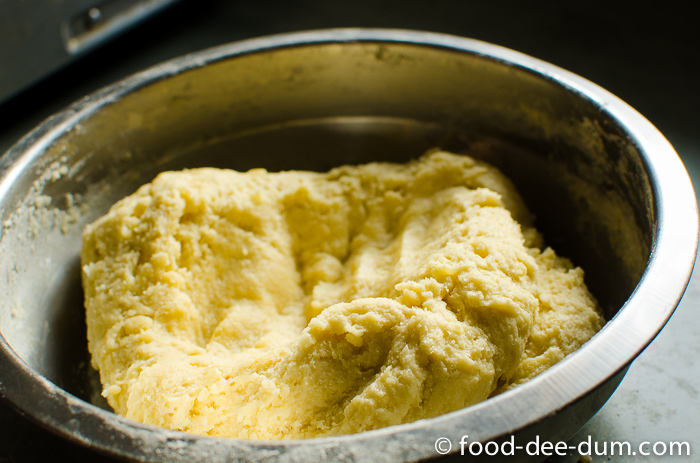 The dough should be allowed to rest for 6-8 hours (or overnight) to allow the sooji to swell and soften. That’s what gives the kulkuls that crunch. When I was ready for the monumental task of rolling and shaping them, I pulled the dough out of the fridge and gave it some time to come to room temperature. If you have access to plastic/wooden kulkul molds then use them as directed. Else follow the jugaad I used – the humble fork (or you can use a brand new, clean fine toothed comb too). 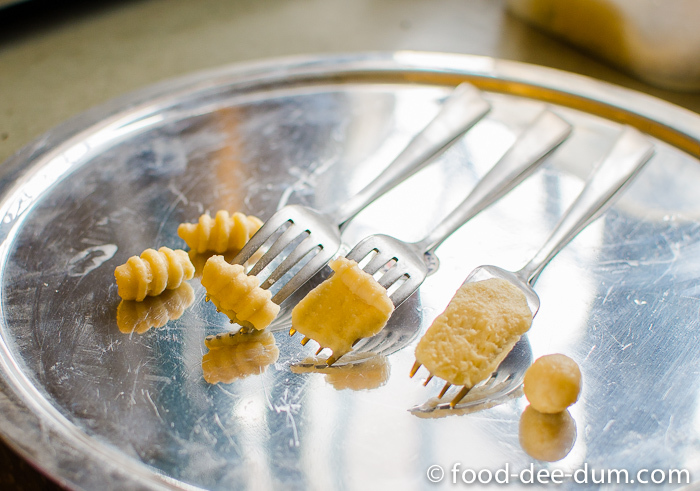 I broke off large pea-sized balls of dough and stretched each across the back of a fork. Then, I gently rolled the dough from one end to the other to form curls (they should look a bit like butter curls or even shells). See the photo below where I have tried to demonstrate the steps, from right to left. 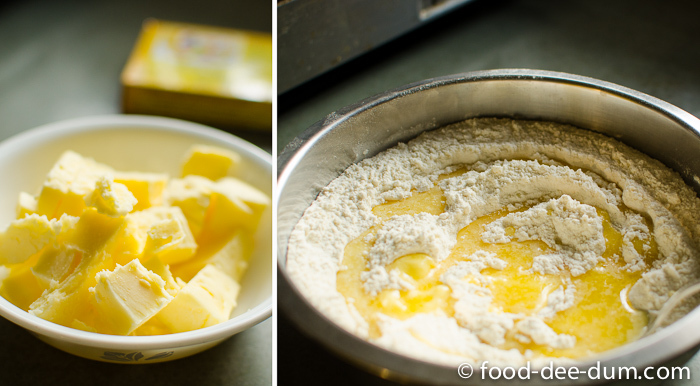 Dough ball>stretched across the back of the fork tines>rolled until it resembles a butter curl>seal. I sealed the rolled flap by pinching it gently with my fingers else the curl would open up during frying. I placed them on clean plates/trays, not allowing them to touch, until I was ready to fry. When all the dough was used up, I placed oil in a kadhai on high heat. Once the oil was hot (a small piece of dough bubbled and rose to the surface immediately), I lowered the heat to medium and added a small test batch. It is imperative that the temperature be moderate so that the kulkuls cook evenly – else they will brown from the outside but remain undercooked from the inside. Also, agitating and tossing them about helps them to fry up more evenly. 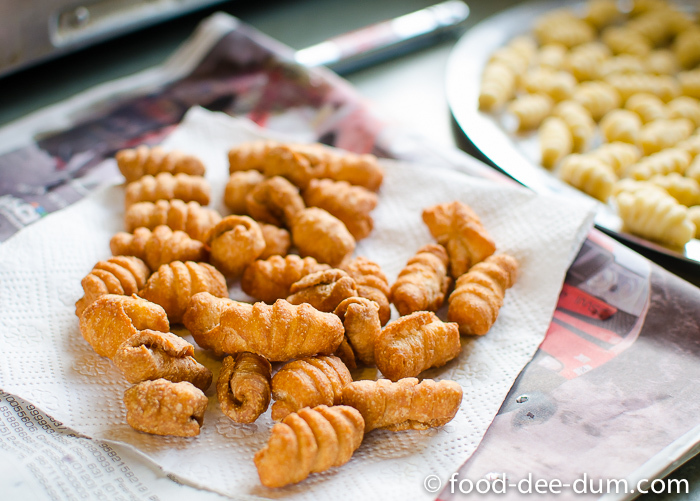 I fried them on medium-low heat, tossing and agitating often until they were evenly coloured to a deep golden-brown. About 6-7 minutes per batch. Lifting them out using a slotted spoon, I placed them on a stack of newspapers+paper towels to drain off the excess oil and cool completely. 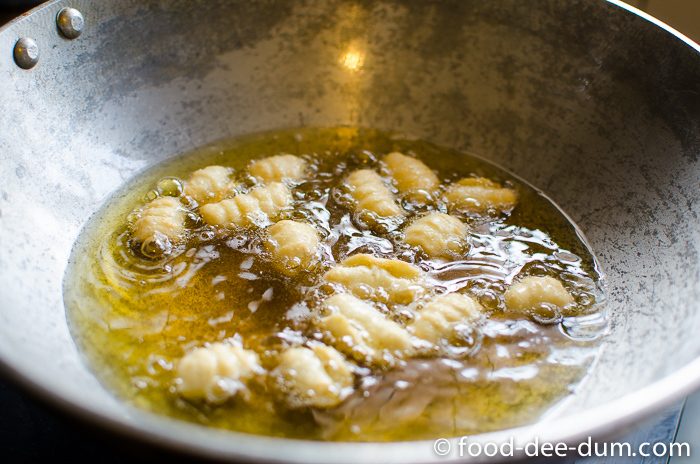 I gave the oil a minute or two between each batch to re-heat and I managed to finish them all in about 4-5 batches. 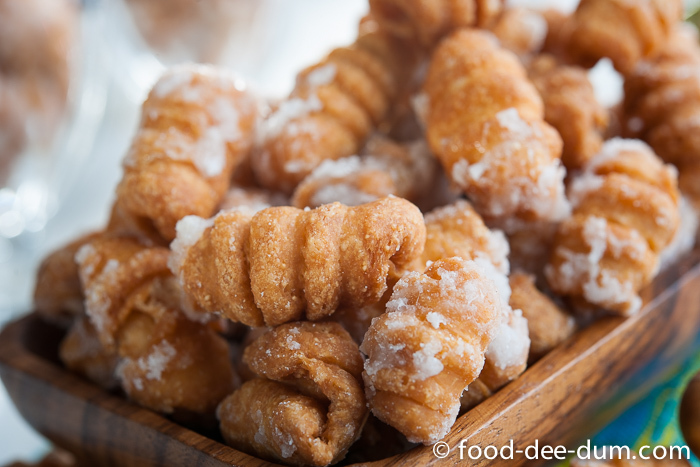 For kulkuls to achieve the correct texture, crunchy from the outside and yet slightly soft (but not dough-ey) on the inside, they have to be allowed to cool completely before glazing. So once the kulkuls were completely cool, I placed the sugar and water in a wide pan and placed it on medium-high heat, occasionally shaking the pan gently, until the sugar melted. Once it had dissolved, I lowered the heat and cooked it for a few more minutes until the syrup thickened and arrived at soft ball consistency, that is, if you take a few drops of the syrup and put them in ice cold water, you should be able to roll it into a soft ball (holds shape but still a little squishy) with your fingers. If you don’t want such a thick sugary frosting, you can stop cooking sugar at the thread stage. 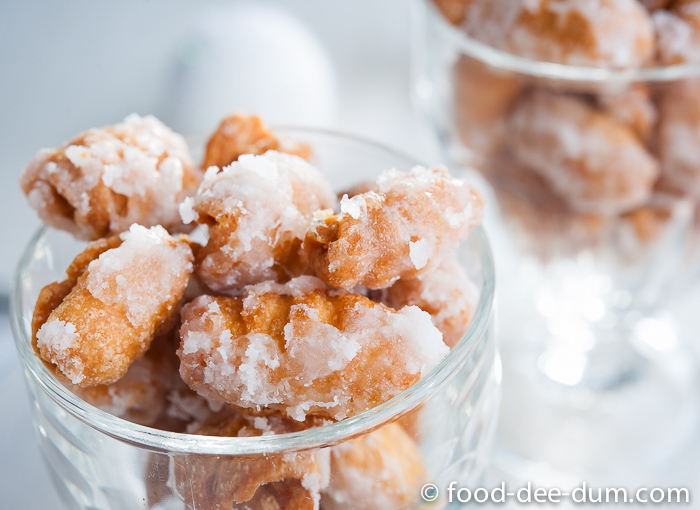 Alternatively, you can forgo the syrup altogether and simply dust the freshly fried (still hot) kulkuls with powdered sugar or icing sugar. Moving on with the syrup. Taking it off the heat, I immediately heaped all the kulkuls into the pan and tossed them about until they were coated with the sugar like a frosting. Separating them, I spread them on clean plates/trays so that they could cool again. If the syrup isn’t thick enough or the kulkuls aren’t cool enough, then there is a great possibility that they will become soggy. So you must make sure of these two things. So here they are. Time consuming but delicious and well worth the effort. I think I may make kulkuls a winter tradition of my own, Christmas-time visit to Pune or not! They can be stored for many weeks in airtight jars and make lovely gifts for friends and family during the festive season! Or you can munch on them greedily all day if you’re not one for sharing. Whatever you do with them, I really think you should go try a batch for yourself! Mix all the dry ingredients. 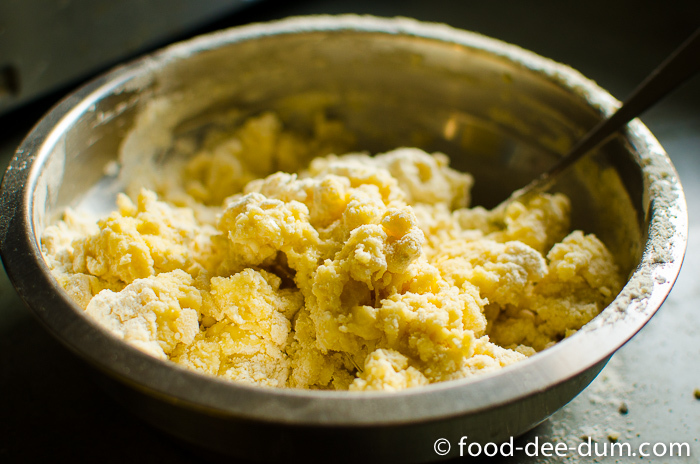 Melt the butter and stir it into the dry mixture. 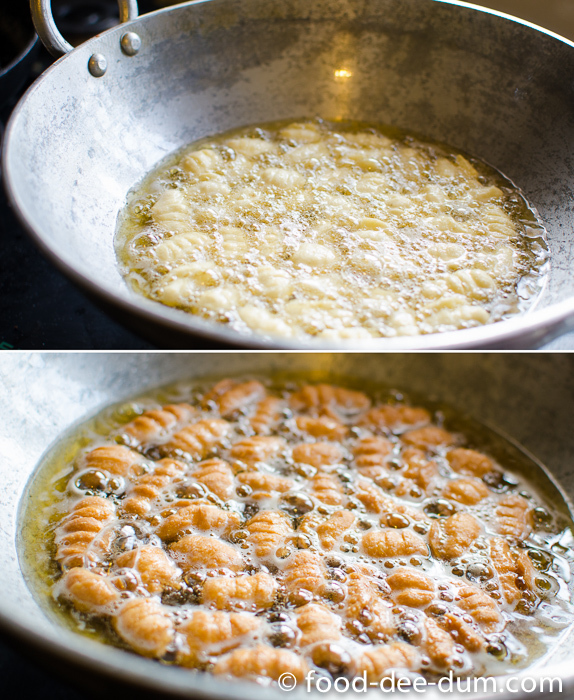 Add the eggs and stir them in until it forms a crumbly, shaggy mass. Add milk, as required, to bring the dough together. It should be a little “tight” like poori dough and not soft and supple like chapati dough. 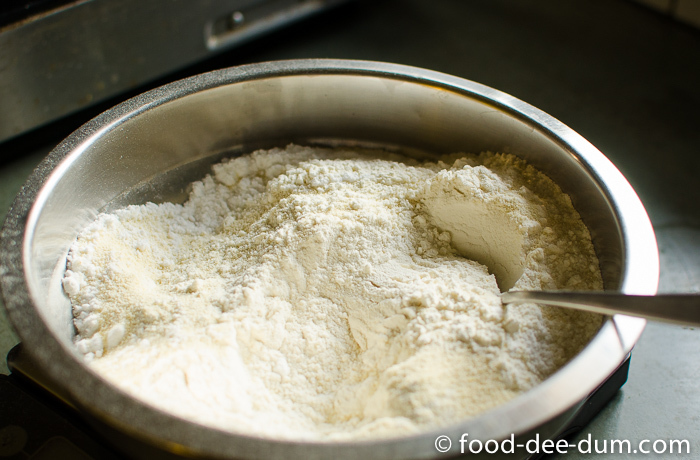 Place the dough in an airtight container and let it rest overnight in the refrigerator to allow the semolina to swell and soften. 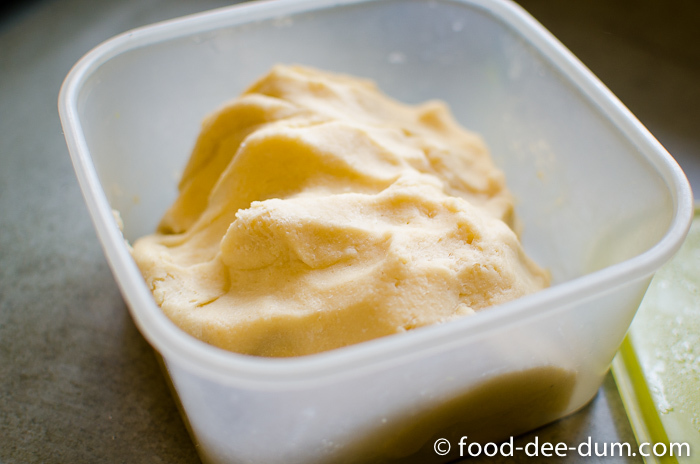 Next day, pull the dough out of the fridge and allow it to return to room temperature before rolling and shaping it. 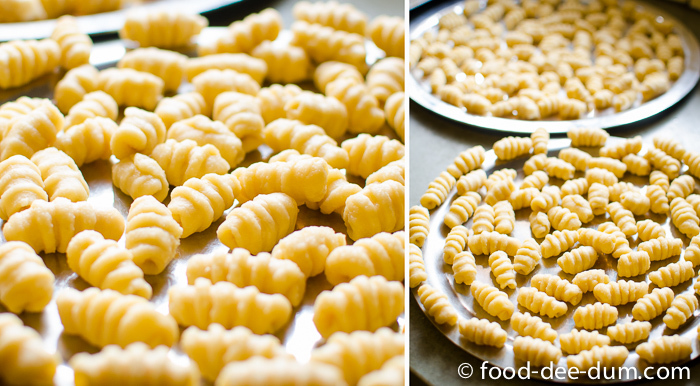 Break off large pea sized pieces of dough and use kulkul moulds to shape it into curls. 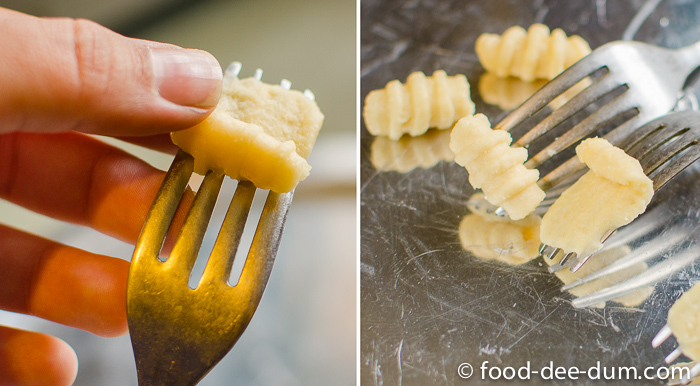 Or use the back of a fork to do the same – stretch the dough portion across the back of the fork’s tines and then gently roll the dough up into a curl and seal the flap to prevent it from opening up during frying. 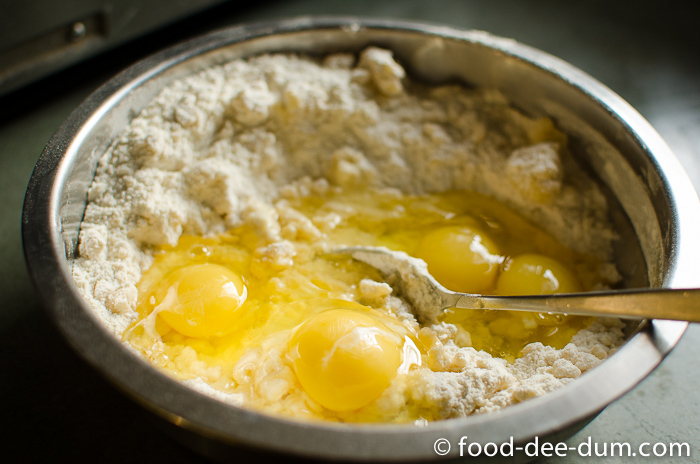 Place these on a clean plate/tray, without touching each other, until all the dough is used up. 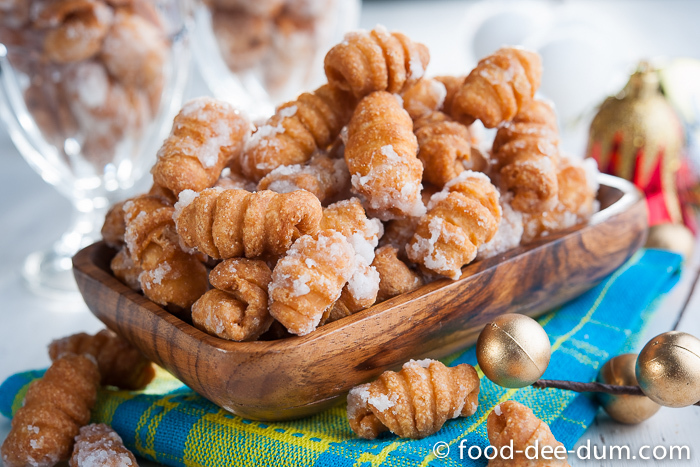 Heat the oil in a kadhai/ frying pan and fry the dough curls in batches on medium-low heat, agitating and tossing often, until they are a deep golden brown. Allow to drain on paper towels and cool completely before glazing. 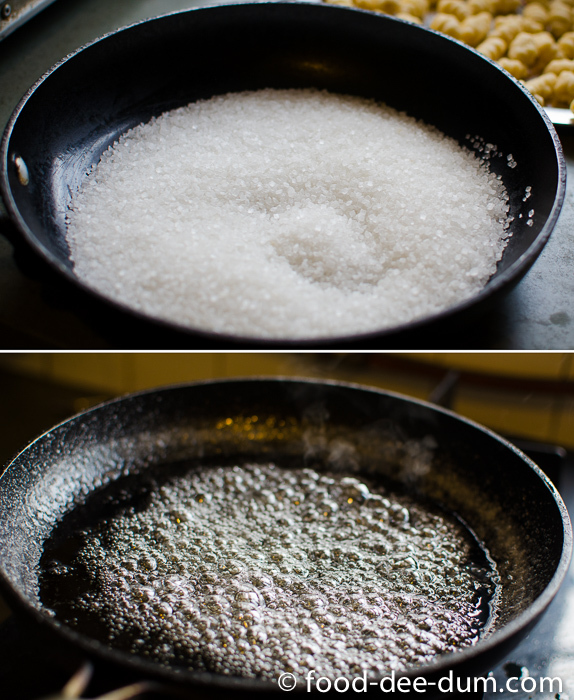 For the glaze, place the sugar and water in a wide pan and set it on medium heat. Shake the pan occasionally but do not stir. Heat until the sugar has melted and then lower heat further to cook for a few more minutes until the syrup thickens and reaches the soft ball stage. Take it off the heat and immediately toss the cooled kulkuls in it until they are well coated. 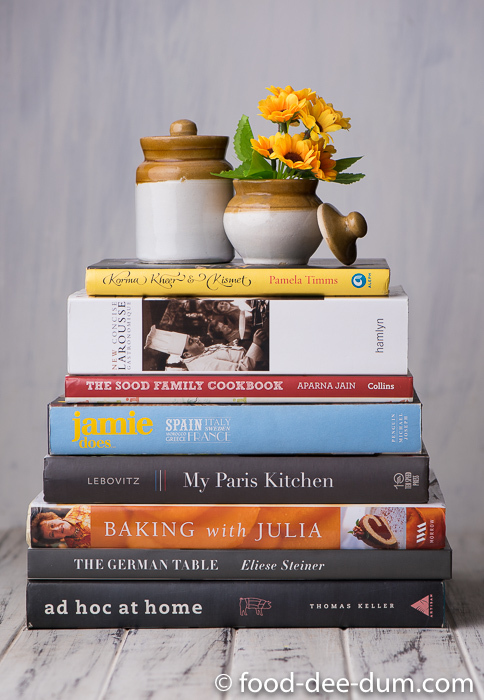 Separate them and spread them out on plates/trays to cool completely before transferring them to airtight jars for storage or gifting.